Uganda is located in East Africa and shares borders with Kenya, South Sudan, Tanzania, Rwanda and the Democratic Republic of Congo. The country also shares a border with Africa’s largest lake, Lake Victoria which covers an area of 68,800 square kilometres in all. The country remains a member of the Commonwealth, although it became independent in 1962. 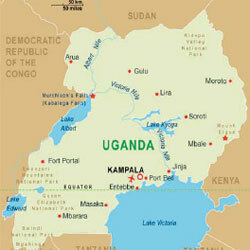 Uganda has a population estimated at around 32 million (similar to Canada), having increased more than 6 fold since 1950. The population is a young one, with the median age being just 15. Kampala, the capital, is home to an estimated 1.6 million people. Cricket is run by the Uganda Cricket Association which is based in the capital, Kampala. Uganda is anassociate member of the ICC and is currently ranked 21 in the world. Uganda are currently Pepsi ICC Division 1 Africa Twenty20 champions and in the newly created East Africa Franchise, Uganda has teams in the finals of the 50 over and 20 over competition. Uganda is one of Africa’s HIV success stories with a reduction in cases of almost 25% in the last 30 years down to 6.4% of the population. However, recent reports suggest that HIV infection rates are increasing again and CWB has an important role to play in spreading the ABC messages across the country. CWB have coached in Jinja, Tororo, Iganga, Masindi, Fort Portal, Mbarara and Mbale, delivering grass roots cricket while also passing on the ABC messages to teachers and players alike. Working with the UCA, CWB are helping to expand the number of primary and secondary schools playing some form of cricket. The UCA organise local, regional and national tournaments for both girls and boys and it is hoped that the work that CWB is doing in the country will unearth some of Uganda’s future international cricketers as well as leaving a lasting legacy with its AIDS awareness work.